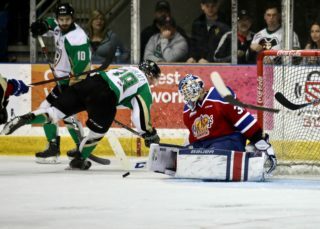 Prince Albert, SK – The Prince Albert Raiders (15-1-0-0) extended their winning streak to eight games on Saturday night, defeating the Regina Pats (3-11-0-0) by a 6-2 score at the Art Hauser Centre. Jakob Brook, Noah Gregor, Brett Leason, and Eric Pearce each had a multi-point night in the win. 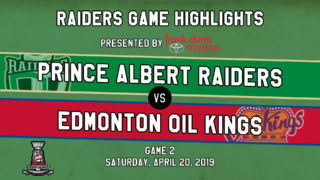 The Raiders jumped out to an early lead in the first period. Just 90 seconds into the contest, Sean Montgomery pounced on a loose puck at the top of the crease and found the back of the net through a scramble in front of the goal for his sixth of the season. Six minutes later, the Raiders extended their lead. Noah Gregor found Justin Nachbaur with a backdoor pass and the Cross Lake, MB product one-timed it home for his sixth of the year. Later in the period, Leason made it a three-goal game. 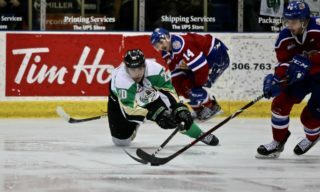 The WHL’s leading scorer snapped a shot past Dean McNabb for his 15th goal of the year. The goal gave Leason 34 points on the season, which set a new career high for points in a season. In the second, the Raiders continued to fill the net. Five minutes into the period, Gregor’s shot from the point found its way through traffic and past McNabb, notching his fifth of the year to make it a 4-0 game. Then, Brook and Pearce became menaces on the penalty kill. At the 7:50 mark of the frame, Brook put a shorthanded shot wide. The puck careened off the end boards to Pearce, who lifted the puck over McNabb for his second goal of the year. Three minutes later, Zack Hayes made a nice blueline-to-blueline pass to Pearce, setting up a shorthanded two-on-one rush with Brook. Pearce made the pass to Brook, who beat McNabb for his fourth of the year. Shortly after, the Pats ended Ian Scott’s shutout bid. Nick Henry was set up with a backdoor pass and the Colorado Avalanche prospect found the back of the net to make it 6-1. In the third, Garrett Wright added another goal for the Pats to round out the scoring at 6-2. 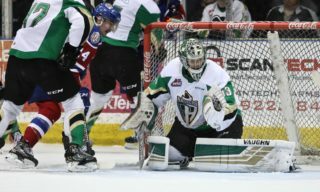 Scott finished the game with 19 saves for the Raiders, earning his 13th win of the year. McNabb turned aside 23 Raider shots in the loss. 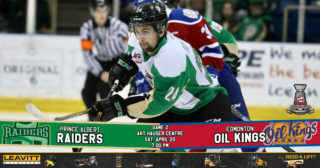 The Raiders are off until Friday night when the Kootenay ICE (4-6-2-1) make their first trip to the Art Hauser Centre. Tickets are available at the Raider Office and at raiderhockey.com. Game time is 7 p.m.